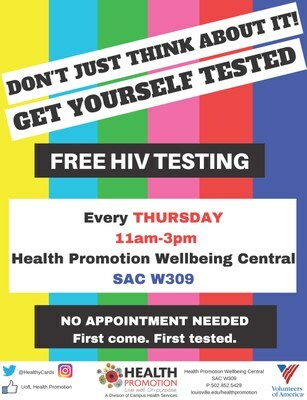 FREE HIV Testing at Health Promotion Wellbeing Central (SAC W309) during the Fall and Spring Semesters! HIV Testing - This test consists of a finger prick, which is a more reliable method of determining one's HIV status. Receive results in office about 20 minutes after the test. HIV testing is available, FREE and confidential, at Health Promotion Wellbeing Central (SAC W309) every Thursday from 11am-3pm during the fall and spring semesters. No appointment needed. First come, first tested. Sexual Health Coaching - Individual sexual health coaching appointments at Health Promotion Wellbeing Central with a certified sexual health advisor.